I don’t love or hate romantic comedies, but the silent era did them better. In the past week, I’ve seen two silent rom-coms—Dollars and Sense (1920) and My Best Girl, and enjoyed them both. Furthermore, I enjoyed them for their own merits. Love conquered, dreams came true, sticky sweetness stuck. 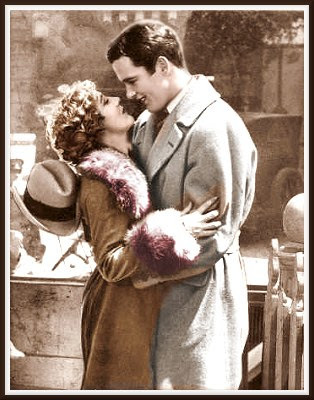 Maybe the stylized fakery of silent film makes romance easier to swallow, at least for cynical boys like me. Or maybe it is the inevitable result of Mary Pickford’s face—surely one of the most magnificent ever filmed. I could go on and on and on about Pickford’s face. Her classic closeup, with cheekbones lit and eyes trained to the ceiling, sky or her lover’s look, is to me a finished sentence. It contains completely her characters’ mix of vulnerability and perseverance. Pickford is pretty, but she isn’t someone you want to possess so much as protect, or at least, help to persist. She is Good. Mary Pickford applied—or contorted—this unique screen presence to fit a bizarre range of characters and situations. She often played tomboys, usually uneducated ones, always tough. Sometimes she took male roles, and once played both a young boy and his mother in a dual role. Typecasting concerned her, but she rarely escaped it completely. Many of her films, geared as they were to the tastes of their moment, feel dated today. My Best Girl does not. It is a late work for Pickford, absent the gimmicks of her peak years, absent even her trademark long hair. She was now 35, still playing a character much younger; in this case, a stock girl named Maggie Johnson, working in a large department store called Merrill’s. At least, I think Maggie’s meant to be younger than 35—I don’t believe we’re ever told. I do know she’s made little of her life, thanks to her wimp of a father (Lucien Littlefield), needy basket-case of a mother (Sunshine Hart), and trampy younger sister, Liz (Carmelita Geraghty), all of whom look to Maggie for stability and sense. There’s immediate poignancy here, as poor Maggie is a hardworking, decent woman with love to give, no man to give it to, and no time to find one. If she’s also on the verge of spinsterhood, so much the better for My Best Girl. All this could be solved by the appearance of ‘Joe Grant’ (Charles ‘Buddy’ Rogers). Joe is a fresh-faced kid, much younger than Maggie, it appears. He doesn’t seem to take anything too seriously, but we don’t mind because he’s young, and because he laughs at himself the most. In his first scene, Joe spies Maggie behind the novelties counter and has her demonstrate various balloon toys to him, as though he were a customer. In fact, he’s a new hire; a stockboy intended to work alongside her. Joe gets a kick out of that one, and Maggie forgives him, because he’s so handsome. Rogers plays Joe as a man utterly without malice, and this is crucial for My Best Girl, because he does a very cruel thing. He is not ‘Joe Grant’ at all, but ‘Joe Merrill,’ the only child of the department store’s wise founder, Robert E. (Hobart Bosworth). The senior Merrill wants his son to learn the business from the inside out; that is, work his way up in a store without the benefit of the family name. Joe Grant is thus a fake, but so lacking in pretention that Maggie falls in love with him. Joe Merrill is in love with Maggie too, but lets Joe Grant do the talking. Joe’s impulsive, Maggie’s desperate—neither takes the gradual approach to this affair. The story’s tension, then, rests first on whether Joe’s engagement to a socialite will keep him from the stockgirl’s arms for good, and second, on whether Maggie will want him once she finds out she’s been duped. Joe is too naïve to appreciate distinctions of class, but Maggie is realistic to a fault. In between the tears and the laughs are scenes of great energy, as Joe and Maggie run gaily through a new life built on lies, blissfully ignorant of the damage each could do the other. Mid-way through the film, we see them cross a dark, busy, rainy street, transfixed by one another and oblivious to the cars, trucks and streetcars narrowly missing them in front or behind, or braking before them with a foot to spare. The vehicles roll in front of the frame as the couple strolls, layering them in a shot of considerable visual depth and perfect timing. It’s funny, too, though most of Pickford’s scenes in My Best Girl are not. Despite her impressive skills as a comedienne, Pickford mostly shoulders the dramatic weight; her family members, in turn, provide most of the laughs. This is a good idea, because Maggie expresses grief and longing with such force that, in moving the audience, she nearly stops the movie dead. In her best scene, however, the star summons all her powers. To describe it completely would give away the film’s ending, but I will say it’s one of Mary Pickford’s greatest performances, and for my money, one of the great performances committed to film. After months of being the victim of a glorified prank, Maggie herself commits a fraud, deliberately portraying herself as a Jazz-Age floozy to prevent the one she loves from making the wrong decision—a decision which, in turn, is the one she most wishes him to make. The result is an incredible dramatic juggle by Pickford, who must act the part of a non-actor trying to act bad, but secretly hoping she fails. And it’s got to be funny, too. That Pickford achieves this without implosion speaks more for her talent than all the cement handprints and golden statuettes (honourary or otherwise) in the world. Films like My Best Girl need little to please their audiences, but this one always brings a little more. And perhaps its genuine spirit is rooted in something deeper than art. For ten years after the film was released, after the arrival of sound and the beginning of Mary Pickford’s permanent decline, she married Charles ‘Buddy’ Rogers, a man 11 years her junior. He was her third husband, and became her guardian and caregiver as she slipped away from public life. A talented musician, Rogers was known for his upbeat spirit, and so I’ve always wondered, watching his smiling Joe Grant pull Maggie’s tearful face close to his own in My Best Girl, if either of them was truly acting. 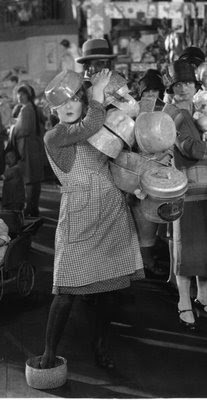 My Best Girl and many other Mary Pickford movies, including one of my favourites, Sparrows (1926) are available through Milestone Films. Milestone’s DVD copy of My Best Girl includes newsreel footage of Pickford’s marriage to Buddy Rogers, along with home movies. For more thoughts on Toronto’s own Mary Pickford, please see my earlier blog entry, Pickford Depicted.